In biology, mutation is a sudden change in the base pair sequence of the genetic material of a living organism, whether the genetic material be deoxyribonucleic acid (DNA) or ribonucleic acid (RNA). In multicellular organisms that reproduce sexually, mutations can be subdivided into germ line mutations, which can be passed on to descendants, and somatic mutations, which cannot be transmitted to descendants in animals. Plants sometimes can transmit somatic mutations to their descendants asexually or sexually (in case when flower buds develop in somatically mutated part of plant). A new mutation that was not inherited from either parent is called a de novo mutation. Mutations can be caused by copying errors in the genetic material during cell division, by exposure to ultraviolet or ionizing radiation, chemical mutagens, or viruses, or can occur deliberately under cellular control during processes such as hypermutation. In evolutionary theory, specifically the theory of evolution by natural selection, mutation is considered the main source of new variation in a population. Although most phenotypic variation is a product of genetic recombination, all new genes are considered to be produced by mutations. For example, a mutation can be postulated for the development of blue eyes in humans. In the two step evolutionary process, production of genetic variation is the chance element, whereas natural selection is not a chance event, but an antichance event. Natural selection is proposed to increase beneficial mutations and select against and eliminate deleterious mutations. However, most mutations actually are harmful, such as seen in genetic diseases, leading to speculation that the role of mutations may be overstated by evolutionary biologists and that other factors, perhaps less random, may be of greater importance in the origin of new designs and macroevolutionary changes. Left: An RNA strand, with its nitrogenous bases. Right: Double-stranded DNA. Mutations involve a change in the base pair of an organism's genetic material. In most organisms, this means the mutation impacts the base pairs of deoxyribonucleic acid (DNA). In some cases, it may mean a change in the base pairs of ribonucleic acid (RNA). The main role of DNA is the long-term storage of genetic information. DNA is often compared to a blueprint, since it contains instructions for constructing other components of the cell, such as proteins and RNA molecules. The DNA segments that carry genetic information are called genes, but other DNA sequences have structural purposes or are involved in regulating the expression of genetic information. RNA serves as a genetic blueprint for certain viruses. However, it plays a diversity of roles in other organisms. RNA may be thought of as the intermediate between the DNA blueprint and the actual workings of the cell, serving as the template for the synthesis of proteins from the genetic information stored in DNA. Some RNA molecules (called ribozymes) are also involved in the catalysis of biochemical reactions. In other words, chemically, DNA is a long polymer of simple units called nucleotides, with a backbone made of sugars (deoxyribose) and phosphate atoms joined by ester bonds. Attached to each sugar is one of four types of molecules called bases: adenine (A), guanine (G), cytosine (C), or thymine (T). Likewise, RNA is a nucleic acid consisting of chains of nucleotides also forming a polymer, with each nucleotide consisting of a nitrogenous base (adenine, cytosine, guanine, or uracil, U), ribose as the sugar component, and a phosphate. It is the sequence of these four bases along the backbone of DNA that encodes information. This information is read using the genetic code, which specifies the sequence of the amino acids within proteins. It reads it in a triplet of bases, with one triplet translating into a particular amino acid. That is, the codon adenine-guanine-cytosine may translate to one particular amino acid, while the codon adenine-guanine-adenine may translate to another amino acid. The code is read by copying stretches of DNA into the related nucleic acid RNA, in a process called transcription. Most of these RNA molecules are used to synthesize proteins. 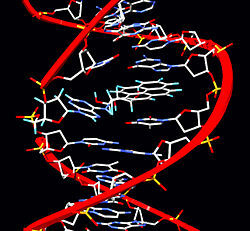 A mutation is a change in the sequence of the four bases along the backbone of DNA (or RNA). As a result, the sequence of amino acids may be changed, which would affect the structure of the protein that is encoded. However, not all changes in the bases (such as a mutation involving a change from adenine to guanine) necessarily results in the replacement with another amino acid, since there is code redundancy, with some different sequences of bases translating into the same amino acid. The functionality of a protein is highly dependent on its three-dimensional structure (how it "folds") and this is highly dependent on the order of the amino acids that make it up. A change in a single amino acid could make the protein non-functional. Within cells, DNA is organized into structures called chromosomes and the set of chromosomes within a cell make up a genome. These chromosomes are duplicated before cells divide, in a process called DNA replication. Eukaryotic organisms such as animals, plants, and fungi store their DNA inside the cell nucleus, while in prokaryotes such as bacteria it is found in the cell's cytoplasm. Within the chromosomes, chromatin proteins such as histones compact and organize DNA, which helps control its interactions with other proteins and thereby control which genes are transcribed. Silent mutations. Silent mutations are those that code for the same amino acid, because of the redundancy of the genetic code. That is, there is a change in the bases but the altered triplet still inserts the same amino acid as before into the protein. Missense mutations. Missense mutations code for a different amino acid. Nonsense mutations. Nonsense mutations code for a "stop" and can truncate the protein. Insertions. Insertions are mutations that add one or more extra nucleotides into the DNA. They are usually caused by transposable elements, or errors during replication of repeating elements (e.g. AT repeats). Insertions in the coding region of a gene may alter splicing of the mRNA (splice site mutation), or cause a shift in the reading frame (frameshift), both of which can significantly alter the gene product. Insertions can be reverted by excision of the transposable element. Deletions. Deletions remove one or more nucleotides from the DNA. Like insertions, these mutations can alter the reading frame of the gene. They are irreversible. Amplifications. Amplifications (or gene duplications) lead to multiple copies of all chromosomal regions, increasing the dosage of the genes located within them. Deletions. Deletions of large chromosomal regions lead to loss of the genes within those regions. Chromosomal translocations. Chromosomal translocations interchange genetic parts from nonhomologous chromosomes. Interstitial deletions. Intersitional deletions involve an intra-chromosomal deletion that removes a segment of DNA from a single chromosome, thereby apposing previously distant genes. For example, cells isolated from a human astrocytoma, a type of brain tumor, were found to have a chromosomal deletion removing sequences between the "fused in glioblastoma" (fig) gene and the receptor tyrosine kinase "ros," producing a fusion protein (FIG-ROS). The abnormal FIG-ROS fusion protein has constitutively active kinase activity that causes oncogenic transformation (a transformation from normal cells to cancer cells). Chromosomal inversions. Chromosomal inversions involve reversing the orientation of a chromosomal segment. Loss of heterozygosity. Loss of heterozygosity involves the loss of one allele, either by a deletion or recombination event, in an organism that previously had two different alleles. Loss-of-function mutations. Loss-of-function mutations are the result of gene product having less or no function. When the allele has a complete loss of function (null allele) it is often called an amorphic mutation. Phenotypes associated with such mutations are most often recessive. Exceptions are when the organism is haploid, or when the reduced dosage of a normal gene product is not enough for a normal phenotype (this is called haploinsufficiency). Gain-of-function mutations. Gain-of-function mutations change the gene product such that it gains a new and abnormal function. These mutations usually have dominant phenotypes. Often called a neo-morphic mutation. Dominant negative mutations. Dominant negative mutations (also called anti-morphic mutations) have an altered gene product that acts antagonistically to the wild-type allele. These mutations usually result in an altered molecular function (often inactive) and are characterized by a dominant or semi-dominant phenotype. In humans, Marfan syndrome is an example of a dominant negative mutation occurring in an autosomal dominant disease. In this condition, the defective glycoprotein product of the fibrillin gene (FBN1) antagonizes the product of the normal allele. Lethal mutations. Lethal mutations are mutations that lead to a phenotype incapable of effective reproduction. Morphological mutations. Morphological mutations usually affect the outward appearance of an individual. Mutations can change the height of a plant or change it from smooth to rough seeds. Biochemical mutations. Biochemical mutations result in lesions stopping the enzymatic pathway. Often, morphological mutants are the direct result of a mutation due to the enzymatic pathway. The human genome contains two copies of each gene—a paternal and a maternal allele. Wildtype or Homozygous non-mutated. This occurs when neither of the alleles are mutated. A Heterozygous mutation. Heterozygous mutations occurs when only one allele is mutated. A Homozygous mutation. Homozygous mutation is when both the paternal and maternal alleles have an identical mutation. Conditional mutation. Conditional mutation is a mutation that has wild-type (or less severe) phenotype under certain "permissive" environmental conditions and a mutant phenotype under certain "restrictive" conditions. For example, a temperature-sensitive mutation can cause cell death at high temperature (restrictive condition), but might have no deleterious consequences at a lower temperature (permissive condition). Tautomerism. Tautomerism involves a base being changed by the repositioning of a hydrogen atom. Depurination. Depurination involves the loss of a purine base (A or G). Deamination. Deamination is a change in a normal base to an atypical base; C → U, (which can be corrected by DNA repair mechanisms), or spontaneous deamination of 5-methycytosine (irreparable), or A → HX (hypoxanthine). Transition. Transition occurs when a purine changes to another purine, or a pyrimidine to a pyrimidine. Transversion. Transversion occurs when a purine becomes a pyrimidine, or vice versa. Alkylating agents (e.g., N-ethyl-N-nitrosourea (ENU)). These agents can mutate both replicating and non-replicating DNA. In contrast, a base analog can only mutate the DNA when the analog is incorporated in replicating the DNA. Each of these classes of chemical mutagens has certain effects that then lead to transitions, transversions, or deletions. Ultraviolet. Ultraviolet radiation (nonionizing radiation) excites electrons to a higher energy level. DNA absorbs one form, ultraviolet light. Two nucleotide bases in DNA, cytosine and thymine, are most vulnerable to excitation that can change base-pairing properties. UV light can induce adjacent thymine bases in a DNA strand to pair with each other, as a bulky dimer. Amino acid substitution. For example, D111E. The first letter is the one letter code of the wildtype amino acid, the number is the position of the amino acid from the N terminus, and the second letter is the one letter code of the amino acid present in the mutation. If the second letter is 'X', any amino acid may replace the wildtype. Amino acid deletion. For example, ΔF508. The Greek symbol Δ or 'delta' indicates a deletion. The letter refers to the amino acid present in the wildtype and the number is the position from the N terminus of the amino acid were it to be present as in the wildtype. In mainstream biological thought, it is held that while mutagenesis is non-random in many ways, the utility of a genetic mutation to the organism in which it occurs does not affect the rate at which it occurs. However experimental evidence exists that in some instances the rate of specific mutations arising is greater when they are advantageous to the organism than when they are not. A frameshift mutation is a mutation caused by indels, i.e.. inserts or deletes in a number of nucleotides that is not evenly divisible by three from a DNA sequence. Due to the triplet nature of gene expression by codons, the insertion or deletion can disrupt the reading frame, or the grouping of the codons, resulting in a completely different translation from the original. The earlier in the sequence the deletion or insertion occurs, the more altered the protein produced is. Missense mutations or nonsynonymous mutations are types of point mutations where a single nucleotide is changed to cause substitution of a different amino acid. This in turn can render the resulting protein nonfunctional. Such mutations are responsible for diseases such as Epidermolysis bullosa, sickle-cell disease, and SOD1 mediated ALS. A neutral mutation is a mutation that occurs in an amino acid codon (presumably within an mRNA molecule) that results in the substitution of a different, but chemically similar, amino acid. This is similar to a silent mutation, where a codon mutation may encode the same amino acid (see Wobble Hypothesis); for example, a change from AUU to AUC will still encode leucine, so no discernable change occurs (a silent mutation). A point mutation, or substitution, is a type of mutation that causes the replacement of a single base nucleotide with another nucleotide. Often the term point mutation also includes insertions or deletions of a single base pair (which have more of an adverse effect on the synthesized protein due to nucleotides still being read in triplets, but in different frames: a mutation called a frameshift mutation). Changes in DNA caused by mutation can cause errors in protein sequence, creating partially or completely non-functional proteins. To function correctly, each cell depends on thousands of proteins to function in the right places at the right times. When a mutation alters a protein that plays a critical role in the body, a medical condition can result. A condition caused by mutations in one or more genes is called a genetic disorder. However, only a small percentage of mutations cause genetic disorders; most have no impact on health. For example, some mutations alter a gene's DNA base sequence but do not change the function of the protein made by the gene. A very small percentage of all mutations actually have a positive effect. These mutations lead to new versions of proteins that help an organism and its future generations better adapt to changes in their environment. For example, a specific 32 base pair deletion in human CCR5 (CCR5-Δ32) confers HIV resistance to homozygotes and delays AIDS onset in heterozygotes. The CCR5 mutation is more common in those of European descent. One theory for the etiology of the relatively high frequency of CCR5-Δ32 in the European population is that it conferred resistance to the bubonic plague in mid-fourteenth century Europe. People who had this mutation were able to survive infection thus its frequency in the population increased. It could also explain why this mutation is not found in Africa where the bubonic plague never reached. A more recent theory says the selective pressure on the CCR5 Delta 32 mutation has been caused by smallpox instead of bubonic plague. ↑ E. Mayr. What Evolution Is (New York: Basic Books, 2001), 279. ISBN 0465044255. ↑ MedicineNet, "Definition of compound heterozygote," MedicineNet.com. Retrieved December 19, 2007. ↑ N. A. Ellis, S. Ciocci, and J. German, "Back mutation can produce phenotype reversion in Bloom syndrome somatic cells," Hum Genet 108(2) (2001): 167-173. PMID 11281456. ↑ Y. Ionov, M. A. Peinado, S. Malkhosyan, D. Shibata, and M. Perucho, "Ubiquitous somatic mutations in simple repeated sequences reveal a new mechanism for colonic carcinogenesis," Nature 363(6429) (1993): 558-561. PMID 8505985. ↑ A. G. F. Pacheco, "CCR5 receptor gene and HIV infection," CDC (2002). Retrieved December 19, 2007. ↑ Public Broadcasting Service (PBS), "Secrets of the Dead. Case File: Mystery of the Black Death," PBS.org (2002). Retrieved December 19, 2007. ↑ A. Galvani and M. Slatkin, "Evaluating plague and smallpox as historical selective pressures for the CCR5-Δ32 HIV-resistance allele," Proc Natl Acad Sci U S A 100(25) (2003): 15276-15279. PMID 14645720. Retrieved December 19, 2007. Leroi, A. M. 2003. Mutants: On Genetic Variety and the Human Body. New York: Viking. ISBN 0670031100. Maki, H. 2002. Origins of spontaneous mutations: specificity and directionality of base-substitution, frameshift, and sequence-substitution mutageneses. Annual Review of Genetics 36: 279-303. Taggart, R., and C. Starr. 2006. Biology The Unity and Diversity of Life. Thompson Brooks/Cole. ISBN 9780495312673. This page was last modified on 20 April 2008, at 18:22.